Do you have an estate plan for your law practice? A proposal now before the State Bar of California Bar Board of Governors would require lawyers to have an "estate plan for the law practice" providing for succession in the event of a lawyer's death or disability. Leaving aside the merits of the proposal, it is yet another indication that the law is an aging profession. Karen Mathis, when chair of the American Bar Association several years ago, often emphasized that 400,000 lawyers of the Baby Boom generation and older will likely retire in the next 10 years, a number equal to the entire membership of the ABA. The law, of course is not the only business sector so affected - estimates are that more than seven million Baby Boom business owners will retire during the forthcoming 10 to 15 years. And studies by MassMutual, Marquette University, Price Waterhouse Coopers and others show that 75% of these business owners have no idea how to financially plan for and handle this transition. This figure surely applies to lawyers in sole and small firm practices, who typically are not known for financial foresightedness. It should go without saying that life insurance, plus a disability policy, is a prudent step for any sole practitioner. There must be reasonable expectations for the kind of policy chosen - a desire to maintain the family's lifestyle unchanged if the lawyer were unable to practice may be outweighed by the current cost of such a policy's premiums. Other elements needed include a will and an estate plan that make legitimate application of all the advantages allowed under law. The plan can estimate and minimize estate tax liability exposure, create trusts to conserve assets and minimize tax impact, provide financially for all the expenses necessary to close a practice, and properly value the practice for estate tax purposes. An estate plan for lawyers should address an important ethical dimension as well. Failure to plan for how clients will be taken care of as a lawyer approaches retirement age can, according to some authorities, be construed as reckless disregard for client welfare - a true ethical violation. An estate plan should take account of how a practice is to be wound up by a personal representative, guardian or conservator in the event of unexpected death or incapacity of the lawyer. Such concerns are perhaps difficult to face objectively. However, the lawyer who has not taken the possibility of his or her untimely death or disability into account for planning a practice's future is playing with fire, and creating a tremendous burden for loved ones left behind - one that may bring intervention by state bar authorities or by creditors. And the final question often asked by clients: How can you effectively represent me if you can't or don't take care of yourself and your family? First, heal thyself. We're on the road taking a rare respite in our Airstream. See the Los Angeles Magazine article that also shows several of our grandchildren. We're having a ball... hope you're enjoying the beginning of your Summer as well. P.S. 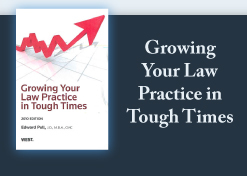 - Check out The 3-Dimensional Lawyer, which discusses management, marketing and financial issues that challenge lawyers in today's world. Click here to learn more and/or order this exciting new product.